And this #1 best selling popcorn maker is HOT indeed. 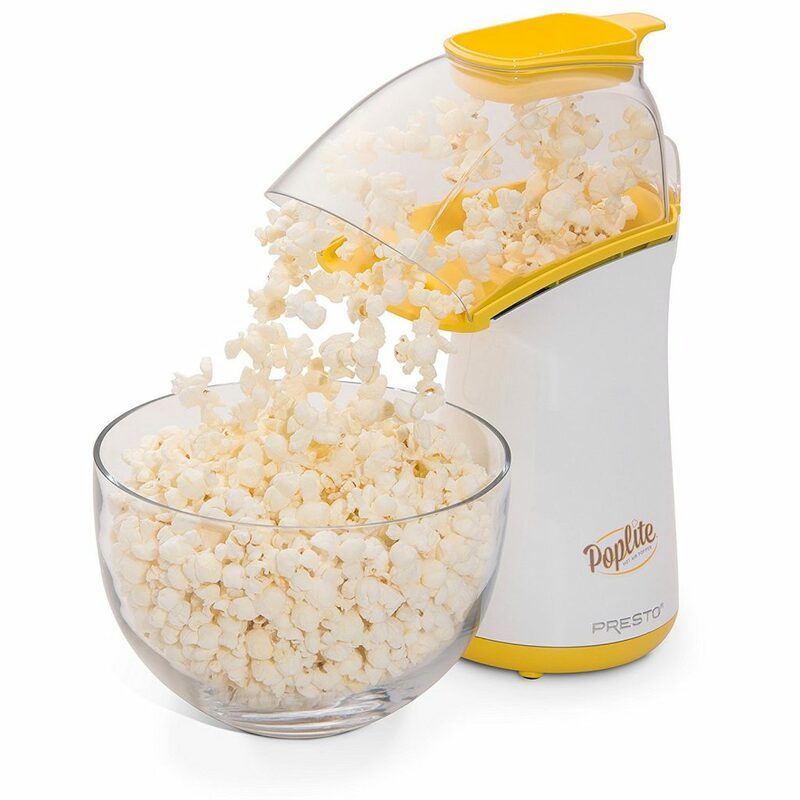 It’s the Presto 04820 PopLite Hot Air Popper, that not only pops faster than microwave popcorn, but it warms the butter as well! You gotta have butter… Lots of it! Plug in Presto’s PopLite and the party begins! In less than 2-1/2 minutes you’ll have up to 18 cups–two large bowlfuls–of fluffy popcorn with virtually no unpopped kernels. And because the machine uses hot air instead of oil, the resulting snack is healthier and lower in calories. That’s not to say you can’t add butter; in fact, the 1/2-cup measuring cup on top of the popper doubles as a butter melter. Simply put in the desired amount of margarine or butter (room temperature is best), and it melts from the heat produced during the popping process. The clear plastic cover and cup, which must stay on during popping so the popped corn doesn’t fly all over the room, easily remove for hand cleaning with warm, soapy water. No other clean-up is required! While a few unpopped kernels spring out the chute as the machine begins to heats up, the chute does a good job of directing the popped corn into a bowl. The popper measures 14 x 9 x 6-1/2 inches, and is identical to Presto’s Orville Redenbacher Hot Air Corn Popper except for color and logo. Presto covers 1 year limited warranty. In test after test, the Presto PopLite hot air popper out popped other leading brands, popping up to 30-percent faster with virtually no unpopped kernels. Pops without oil for up to 42-percent fewer calories than microwave bag popcorn, no artificial flavors, saturated fats, preservatives, or added salt. Hungry for a Delicious Snack Yet? Grab this Presto 04820 PopLite Hot Air Popper HERE!